Recently someone (I can’t remember…I blame booze) asked what kind of things Landon has for lunch. We are super lucky to have a stellar daycare that prepares his lunch. 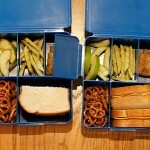 Lucky in the fact that I don’t have to pack lunches because that sounds awful. It also makes me feel less guilty when weekend lunches are PB&Js and carrot sticks! 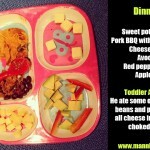 So this week I am sharing his daycare menu to give you guys a taste of what he has. Maybe it will help kickstart some ideas. A lot of these are also good for dinner obviously. Exciting stuff. Obviously there is a vegetarian option each day and we are always welcome to ask they not be given something. They are a nut free facility so that bases a lot of things. The meals are also slightly altered for infants and small toddlers. They can start getting menu food whenever you like. We loved this when Landon was an infant because they could expose him to even more things. The Pre K class has also been known to make their own snacks as an activity. They even made pie on Pi Day :). So what do your kids eat at lunch? Are you stuck in the same rut? Our daycare does Organic Life which is an all organic meal delivery service. 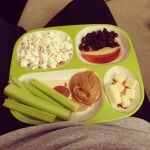 I know that my kids are getting two great, healthy meals and two great snacks a day. That doesn’t meant that they love it but it helps when I serve a pizza at home! I am very thankful our daycare makes meals. For a while, I was preparing his snacks and lunches everyday because little dude is gluten free. 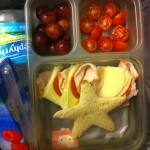 After daycare figured out they can get reimbursement for gluten free foods, they started making all of his meals/snacks. What a huge load off of me. I still have to blend his tube feeding meals (my own control freak choice) but at least I’m not preparing his oral meals too. 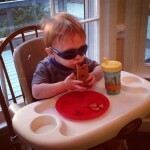 My son tends to eat better at daycare than he does at home because of peer modeling. 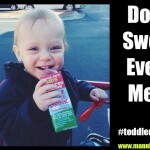 He is more likely to try new foods at daycare. There are certain items he will eat at daycare but refuses at home and vice versa. Some of that behavior is probably because of his GI issues but I imagine the same could be true for typical kids as well. So yeah, another positive for daycare! I am super jealous of your daycare! Our current one does not supply lunch at all (which is ridiculous given the cost), so I’ve been using your website to for toddler dinner/lunch inspiration and it has been a lifesaver. I feel like I should point out, our last daycare did supply super crappy processed lunches and I wasn’t happy with that either – so maybe I’m just hard to please. Anytime you want to post more menu examples from daycare please do because I can always use ideas!! My kid normally has leftovers from the previous nights dinner, plus a fruit. I send yogurt, cheese, or something like that for a snack.